Investigators say at least one million litres of crude oil was released when a train derailed last month on a ranch in western Manitoba. The Transportation Safety Board says the spill was mostly contained in a low-lying area next to the track, and it's too early to comment on the environmental impact. 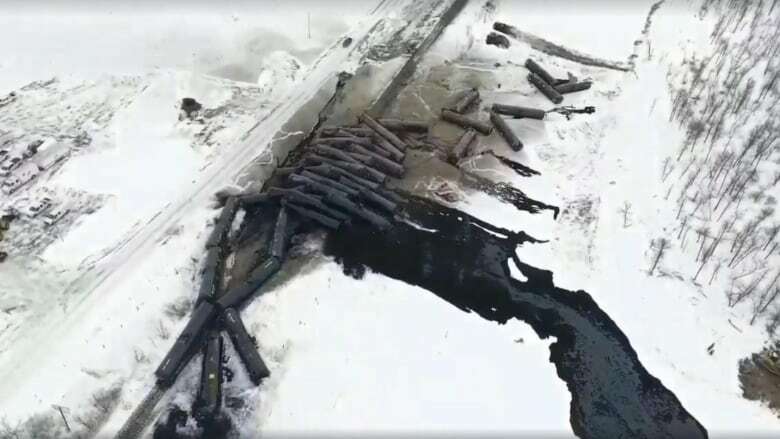 The Canadian National train, with 110 petroleum crude oil cars, was travelling east in the early hours of Feb. 16 near St. Lazare, Man., when an emergency brake was applied. The Transportation Safety Board says 37 of the cars derailed and 16 sustained breaches. There were no injuries, there was no fire and no area residents were evacuated.